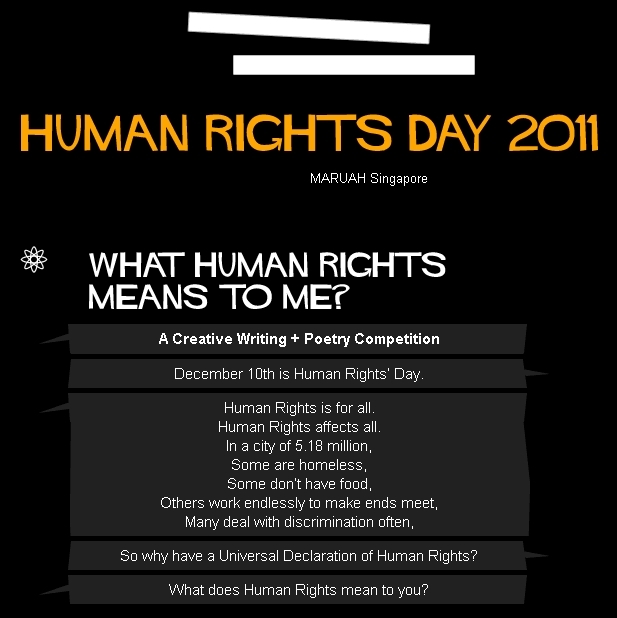 MARUAH has created a microsite for Human Rights Day 2011. Visit the link above to view the finalists of our Creative Writing and Poetry competition. We have also posted videos produced by the United Nations on what human rights is all about. Don’t forget to join us tomorrow, 10th Dec, to celebrate Human Rights Day together with us. You will get to hear from Mr Richard Magnus, the Singapore representative to the ASEAN Intergovernmental Commission on Human Rights (AICHR), find out the winners of our Creative Writing and Poetry competition, and participate in our Open-Mic event. First 50 individuals get FREE drinks and food! This entry was posted on Friday, December 9th, 2011 at 10:03 am and is filed under Events. You can follow any responses to this entry through the RSS 2.0 feed. You can leave a response, or trackback from your own site.